One of the keys to eating well is to eat like a local - find local delicacies and fresh produce that has come from the area. This tends to mean fresh, seasonal specialties and above all a taste of the region you're sure to savour more than the cheap souvenirs you bought. 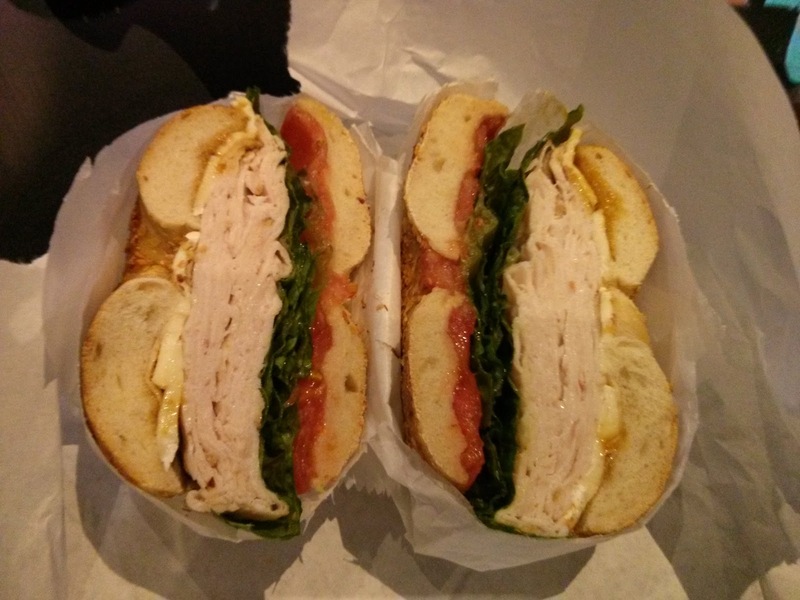 In New York this means bagels and coffee, and there's none better than Murray's Bagels. This is New York where throughput is high and patience is thin, so make sure you choose your bagel and your toppings as you wait in line. The slightest hesitation or questions as you order will lead to eye rolling from the 20 people behind you in the line. This adds up to rapid no fuss service though, despite the popularity of this store the ordering process takes less than 5 mins. 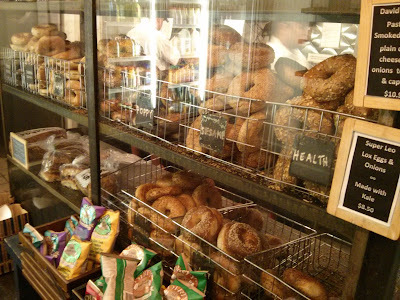 Choose your bagel as you go past - white, whole wheat or bran dough is rolled in all sorts of toppings. I favour the Onion Bagels and Health Bagels studded with delicious grains and seeds. The topping options are seemingly endless. For a breakfast classic try an Everything Bagel with Scallion or Vegetable Cream Cheese $3.50 USD , for lunch a deli sandwich piled high with cured meats and salad. 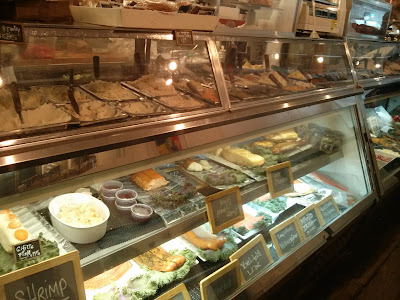 Those fond of Jewish cuisine will find fresh handmade chopped liver, gefilte fish and endless freshly smoked fishes including salmon or lake sturgeon. 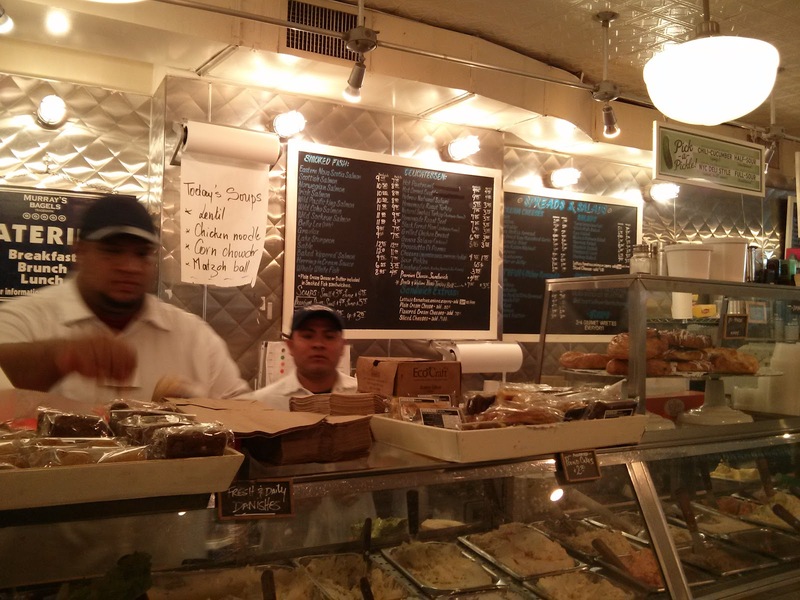 The army of sandwich kings are efficient machines, they take my order and cheerily squabble in a variety of languages. Coffee orders are yelled down the line and I receive my order in mere moments. Here's a delicious example of their wares, a complete meal in a handful - delicious with chewy high quality bread. A true New York classic. Move fast, New York hates a dawdler!